During the Melbourne Writers Festival, DECV students from Years 7-10 have the opportunity to attend the Schools’ Program each year. This year, a group of students and teachers attended a range of sessions exploring diverse topics. It concluded with a Great Debate from members of the state debating team. It was stimulating, engaging and humorous. 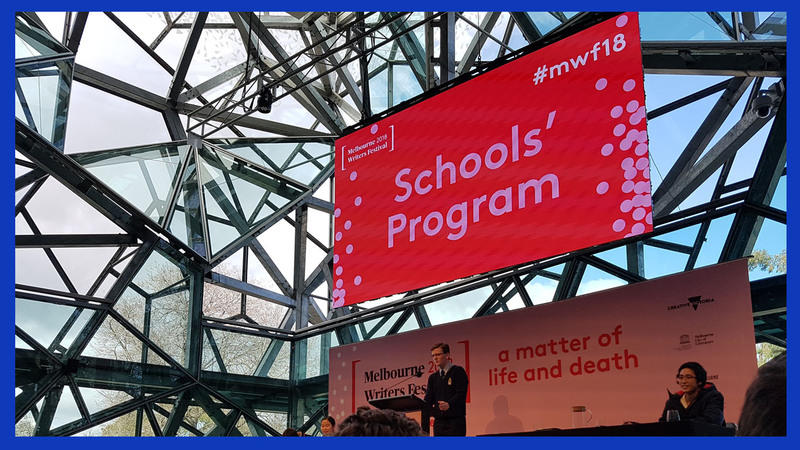 On Monday, 27th August 2018, students and teachers from DECV attended the majestical gathering known to literary nerds across the state as The Melbourne Writers Festival. It was a great day, filled with inspiring and thought-provoking sessions. These included headliners such as Alice Pung, Sammy J, the Victorian state debating team and MC Mantra to name a few. Overall, it was a great excursion full of fandom and in-depth conversations, as well as political points of view. Lots of movement and lots of opinions. Freethinking. Writing. Breathing. Something to live for. On Monday, I had the opportunity to go to the Melbourne Writers Festival. There were a few laughs here and there, and many learning opportunities. In fact, it was so fun and motivating, I decided to write a short piece for the e-newsletter (actually, they asked me to do it). All jokes aside, I learnt about a new genre: satire writing. Satire writing is mainly sarcastic in style but usually gives a strong opinion about one or more topics. Who would have thought a writers festival could be so fun! I really enjoyed this experience. Across the Distance enews is the Distance Education Centre Victoria's weekly publication which is sent to all currently enrolled students, their parents and supervisors. Current edition articles can be found on the DECV website home page. Please contact the publisher by email if you would like access to articles from previous enews publications.